In this Let's Try video tutorial we will learn how to shoot using raycasts. 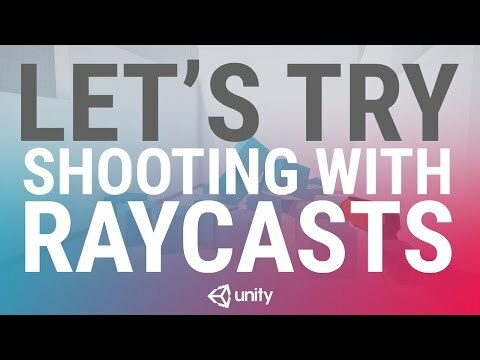 In this tutorial we will learn how to shoot using raycasts. game objects that have been hit by the ray. a hit with the ray. mouse or the right joystick on a gamepad. of the centre of the camera. a raycast from the centre of the camera. forward in to the game world. game object a hit is registered. at directly, they can shoot. that we see here in the game view. Let's play our scene and test. As you can see we can turn and look around. the player is aiming in. This is not a raycast. a visualising and debugging tool. we can hit the boxes and apply physics forces to them. we can see two lines. marked by the red reticle dot. click the link below to begin the download process. folder called Let's Try Shooter. which holds this completed scene. you will see a scene called shootingWithRaycasts. and is the scene we will be working in. look very similar to the eye. which we will use for our gun. We'll call this script RaycastShoot. to the Gun in the hierarchy. of the type int called gunDamage. We will initialise it to 1.
and initialise it to 0.25.
and initialise that to 50.
cast in to the scene. and initialise it to 100.
our laser line will begin. laser will be drawn for. each one in the game view. which a rigidbody hit by the ray. has passed since they last fired. our shot frequency public variable. Meaning the player can fire once more. stored in our nextFire variable. to equal time.time + fireRate. on and off our laser effect. We will do this using a coroutine. to play our shooting sound effect. before it turns out laserLine back off. and 0 on the Z axis. To understand this better let's return to Unity. turn off the main directional light temporarily. game object which hold the camera. Now we can see the camera's view frustum. or pyramid with the tip cut off. is the far clip plane. for our camera's view port. and the top right is defined as 1,1.
centre of our camera's viewport. or exactly where the player's position is. if it hits a game object with a collider attached. points for it to draw between. to the end of our gun in the scene. at the end of the gun. raycast for a number of things. end point of our laserLine will be. it will evaluate to true. if our raycast hits something. in addition to it's return type. in this case 50 units. for the end of our laser. to account for that behaviour as well. position of our line to hit.point. in the forward direction of our camera. visible in the game view. and choose Game Object - Create Empty Child. this new child object to GunEnd. front of the barrel of our gun. set the position on the X axis to 0.36.
and the position on the Z axis to 1.
directly in front of our gun barrel. to the Gun End field RaycastShoot. the line a little bit narrower. We'll set the Start and End width to 0.05.
and this is why it will render pink. component is to disable it. and make sure the component is disabled. so it should be disabled by default. be useful to visualise them in the scene view. our raycasts in the scene view. final build of your game. and select Assets - Create - C# Script. Name the new script RayViewer. RayViewer to open it for editing. The first thing we'll do is delete the default comments. called weaponRange, and initialise it to 50.
our line will travel in to the scene. of the type Camera called fpsCam. we used to calculate the origin of our ray. Next we will call Debug.DrawRay. cast in the scene view. the line to begin being drawn. we want our line to be drawn in. In this case away from the camera. we want our line to be drawn. can't yet affect the objects in the game. that we want to interact with. the Target Box game object. which is set to 3.
to open it for editing. ShootableBox is a simple health script. which is initialised to 3.
which returns void called Damage. of the type int called damageAmount. is less than or equal to 0.
that this script is attached to. Let's return to our rayCastShoot script. attached to the collider that our raycast hit. and parse in our variable gunDamage. it will be stored in our variable health. component attached to the thing we hit. we hit with our raycast. force to it to move it around. We will do this using the function AddForce. parse in -hit.normal * hitForce. from the surface that was hit. when we shoot the object. and return to Unity to test. already have a rigidbody component attached. So they should be ready to shoot. So our basics are working. It's still a little bit difficult to aim. which will be our UI for our reticle. the reticle UI is very simple. in the centre of the screen. Game Object - UI - Image. Let's switch our scene view in 2D mode. The first thing we'll do is change the image's color. to make the image red. to the centre of the screen. and click on the centre preset. of our screen but it's still too big. and set it to 5.
and set that to 5 as well. anchored in the centre of our screen. That's the basics for shooting with raycasts. If you prefer to take this tutorial in article form, please click here. Download the Let's Try Assets from the Unity Asset Store for free here.